These beautiful bronze and gold baubles entwined with the gold coiled ribbon make a stunning image for your holiday ecards for business this year. The bronze bauble shines delicately with a shiny gold pattern wrapping itself around the piece delicately. The golden bauble compliments the bronze bauble wonderfully with a luminous gold shade and also has a pretty pattern all the way around the bauble. The fine quality of the gold ribbon is transparent, as you see the way it curls around the baubles, showing its rich quality and it captures the soft glow of the candle light prettily. This lovely centrepiece of baubles and ribbon is placed onto a gold surface, adding a subtle shadow of the baubles, giving this a cosy warm feel. When the ecards play, the baubles sparkle delightfully. In the background, there is a trio of candles burning and the middle candle is slightly taller that the other two, creating a lovely sequence of light. 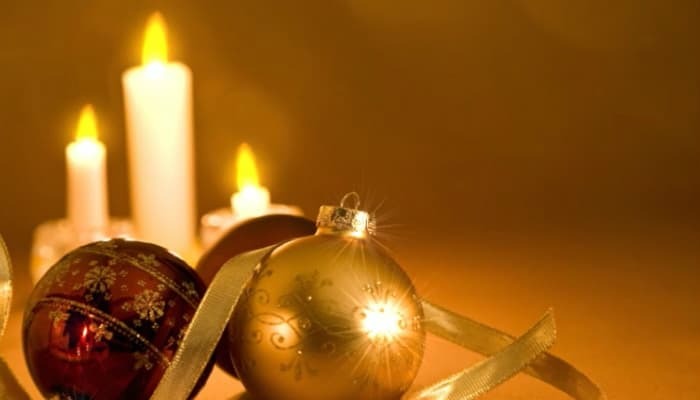 The Christmas holiday candles are warm and glow softly behind the centrepiece of baubles and ribbon and the animation of the candles flickers when the ecards play, creating a very realistic and life like quality. At Ecard Shack, we pride ourselves on delivering only the highest quality of Christmas ecards for business.